You Can't Dream Big Enough! With over 60 years in broadcasting, more than 50 of those at Chicago's WGN, Orion Samuelson has compiled a record of service to the nation's farmers and ranchers that will likely never be surpassed. In his long-awaited memoir, You Can't Dream Big Enough, Orion covers the highlights and lowlights of his exciting career, from dinner at the White House to a caviar & vodka banquet in the Kremlin. His agricultural travels took him to 43 countries and he criss-crossed America in his private plane, "Air Orion," on which he had a near-death experience. Orion tells about a bone disease that left him house-bound for his first two years of high school, and, in the prime of his career, an attack by flesh-eating bacteria that not only nearly left him mute, almost killed him. Orion's life long commitment to agriculture has been recognized by organizations in all segments of agri-business. In 1998, the American Farm Bureau Federation honored Orion with the AFBF Distinguished Service Award. 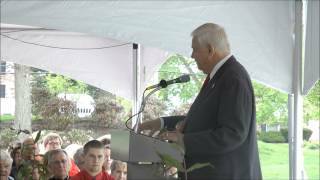 In 1997, Illinois Governor Jim Edgar renamed the State Fair Junior Livestock Building the Orion Samuelson Junior Livestock Building as a tribute to Orion's four decades of service to the agricultural youth of Illinois. Orion is also in the Illinois Broadcasters Hall of Fame, the Illinois 4-H Hall of Fame, the National 4-H Hall of Fame, the Scandinavian-American Hall of Fame and the National Association of Farm Broadcasters Hall of Fame. Orion added author to his resume November 1st, 2012 with the successful launch of his autobiography, "You Can't Dream Big Enough", which is an inspiration to young people everywhere.